In blackjack, players face various difficult situations in which it is hard to determine what is their best option. Since it is a skilled-based game, it is really important to have a reliable strategy which will help you successfully tackle tricky hands. If you make your moves in a random manner, you will most likely run out of money in no time. Nowadays, there are a number of strategies and systems which have been especially designed to help players overcome the house edge. Therefore, it is very accessible and easy to improve your game as all you need to do is to put effort into learning them. At some point during the game, you can expect to receive two cards of the same value. In such cases, you are allowed to split them and form two new hands. Whenever many players get a pair, they split it automatically, without taking into account the dealer’s up card or even their odds of winning. However, in blackjack every card combination is unique and it requires a different approach. This move can be really beneficial for you only on the condition that you know how to take advantage of it. When you are dealt two cards of the same rank, you have the chance to split them into two individual hands. They are separate hands and you should treat them as such, meaning that you should apply a different strategy for each one of them. When you split a pair, you are required to put a bet whose amount is the same as your original wager. After you are dealt one card for each hand, you are ready to play them. In most cases, if you get another pair, you are allowed to perform the same move once again which is often referred to as re-splitting. It is vital to become familiar with the best approach for all of the different pairs as only then you will be able to handle such situations with ease. As already indicated, if you want to increase your chances of winning and get the most out of every hand, you should use an efficient strategy and apply it correctly throughout the game. The first thing that you need to know when you have two cards whose rank is identical is that you should treat such card combinations differently. Some pairs are extremely beneficial and require splitting in any case, whereas others shouldn’t be split. Let’s have a look at some of the pairs which you can get during the course of the game and how to cope with them successfully. In order to manage to make the most of every situation, you should always follow a strategy and consider what the dealer is showing. We will discuss the pairs which consist of 2’s, 3’s or 7’s together due to the fact that the strategy for them is the same. It is useful to try and group the pairs which have an identical or similar strategy as this way you can remember them much easier. If you ever find yourself in a situation in which you have any of the aforementioned pairs in your hand, then your best options are two – to either split or hit. If the dealer’s up card is from two through seven, you should split the pair. The reason why it is beneficial for you to make this move is that the dealer is placed in a weak position. In such cases, you should always try to accumulate as much money as you can because you have good chances of winning. When the dealer has an eight, a nine, a ten or an ace, then your best move is to hit. If you split the pair in such situations, the total of any of the two new hands won’t be most likely sufficient to beat the dealer’s. Having two 6’s in your hand as your first two cards is considered to be a rather unfavourable way to start the game as your chances of busting are significantly high, providing that you hit. The strategy for this pair requires the same approach as for the rest of the above-mentioned pairs, except for the cases in which the dealer has a seven as then you should hit. The reason why you should refrain from splitting in this case is that if you do so, you will most likely end up with two weak hands. Whenever you have two 4’s, splitting is also among the best moves that you can make, however only in two cases. If the dealer’s up card is a five or a six, it is best to separate this pair and form two new hands. The motive behind this move is that by splitting the two cards, you have a good chance of creating a advantageous situation in which you can double down. For the rest of the cases, you should hit due to the fact that the cards in the deck that work in your favor are more than the ones that will cause you to bust. If you happen to receive two 9’s, then in most cases you should split due to the fact that each hand will get a nine which is a fairly good start. Both new hands have decent chances of forming a strong total and beating the dealer, especially if he is in a weak position. If his up card is from two through six or an eight or a nine, then you should perform this move. If the dealer is showing a seven, a ten or an ace, it is advisable to simply stand. If you opt for any other move, you will most likely end up losing your bet. By choosing to stand, you have a very good chance of beating the dealer or at least, have the same hand as his which is a tie. The rules regarding splitting can vary, depending on the casino and the version you are playing. 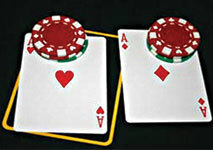 In some games, you are allowed to split every pair, however when it comes to aces, you are limited to do so only once. In general, it is always best to check all of the rules regarding a pair of aces since it consists of two of the most powerful cards in the deck. It should be noted that if you manage to get blackjack as a result of split aces, it is considered simply as any other combination whose total is twenty one. The payout in such cases is even money, not the usual 3/2 for blackjack. Sometimes it is permitted to double down after splitting but sometimes it is not. In the latter case, the house edge is increased by approximately 0.12%. You should always check the rules of the version you are going to play in advance so that you can alter your strategy accordingly. The rules regarding re-splitting can also differ from one casino to another. In some games, you have the chance to re-split pairs as many times as you wish, whereas in others you might be restricted to a limited number of hands. When it comes to re-splitting aces, it should be noted that there are versions which completely deprive you of this option. Blackjack is an extremely exciting game which offers you the opportunity to influence the outcome of every hand by using a strategy. One of the card combinations which you can get during the course of the game is two cads of the same value. While it is true that there are many pairs which should be split, you need to also note that there are some which you should avoid splitting. In order to manage to handle such situations in a proper manner, it is advisable to get familiar with the best moves for them.